Bundt cakes are great — they look impressive, you don’t have to worry about fancy frosting techniques (not that I do anyway), and they come together quickly. The one here is one of my favourites — it’s like pancakes loaded into a bundt cake with the flavors of maple with chocolate, raspberries, and a hint of buckwheat flavor. You know, so you can have it for breakfast. To make the cake, preheat the oven to 350 degrees F. Lightly oil a 10-inch (12 cup) Bundt pan, using a pastry brush to thoroughly coat the bottom and side of the pan. Sprinkle with sorghum flour, tapping out the excess. Put the buckwheat flour, sorghum flour, millet flour, 1/2 cup of the tapioca flour, and the arrowroot flour, baking powder, xanthan gum, baking soda, and salt in a large bowl. Whisk to combine. Put the sugar, coconut oil, flaxseeds, maple extract, and vanilla extract in the bowl of a stand mixer, with the paddle attachment, or a large bowl. Turn the stand mixer or a hand mixer on medium-low speed. Beat until well combined. Turn the mixer to low speed. Alternately add the flour mixture (in three additions) and the vegan buttermilk (in two additions), beginning and ending with the flour mixture, beating well after each addition. Turn off the mixer. Put the raspberries, chocolate chunks, and the remaining 1 tablespoon of tapioca flour in a medium bowl. Toss until the chocolate chunks and raspberries are well coated. Add the mixture to the batter, gently stirring until evenly distributed. Immediately stir in the cider vinegar until just combined. Scrape the batter into the prepared pan using a rubber spatula, smoothing the top. Bake in the centre of the oven for 40 to 45 minutes, until a toothpick inserted in the center of the cake comes out clean. The cake will be golden brown, begin to pull away from the sides of the pan, and will spring back when lightly touched. Let cool in the pan for 10 minutes, then invert the cake directly onto a serving dish. Cool to room temperature before preparing the icing. When ready, to make the icing, put the maple syrup, nondairy milk, vegan buttery spread, and sea salt in a medium saucepan. Bring to a boil, and boil for 2 minutes. Reduce to a simmer, add the sorghum flour, and cook for 1 more minute. Remove from heat and add the maple extract, mixing well. Add the confectioners’ sugar. Mix well. Set aside to cool for about 30 minutes. To serve, spoon the icing over the cake, letting it run down the sides, completely coating the cake. Let stand about 15 minutes to set. Serve at room temperature. Leftovers taste best stored in a sealed container for up to 3 days at room temperature. Note: To make vegan buttermilk, put 1 tablespoon of cider vinegar in a liquid measuring cup, then pour in enough nondairy milk to make 2 cups total. Let stand about 5 minutes, until curdled. A bright mixture of late winter fruits and veggies, combined with salted pistachios and dried cranberries deliver a bounty of textures. The vinaigrette ups the ante with a infusion of flavor: bitter tahini, sweet maple, tangy vinegar, and fruity olive oil. I used a Premium White Balsamic Vinegar and Coratina Extra Virgin Olive Oil from Della Terra, and local dark maple syrup. 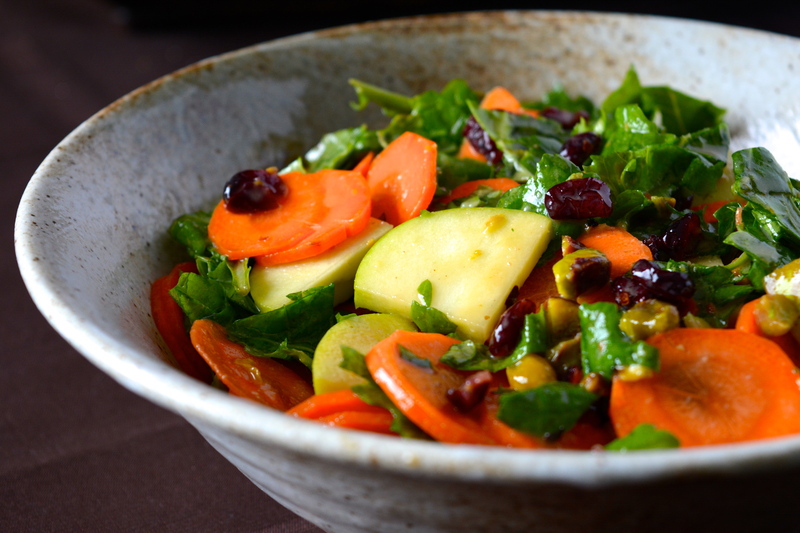 Put the kale, carrots, apples, cranberries, and pistachios in a medium bowl. Mix to combine. For the olive oil, balsamic vinegar, maple syrup, tahini, ginger juice, and a pinch of salt in a small jar. Shake until emulsified. Taste for seasonings, adding salt if needed. Pour the mixture onto the kale mixture. Toss to combine. Serve immediately. Served alongside the Maple-Kissed Cornbread from my first book, The Allergy-Free Cook Bakes Bread, I love the combination of spicy and sweet in this super easy recipe. Like most soups and stews, this one tastes even better the second day. If you want a sweeter chili, add a little more maple syrup–of course! Depending on who I am serving it for, adding some finely chopped jalapeño into the bell pepper mix adds just the right amount of kick that I love. Heat the oil in a large Dutch oven over medium heat. Add the onions and peppers, stirring until softened. Add the mushrooms and garlic, continuing stir often until mushrooms have released their juices and are cooked through. Add the water, tomatoes, lentils, chili powder, cumin, thyme, and cinnamon to the mixture. Stir to combine. 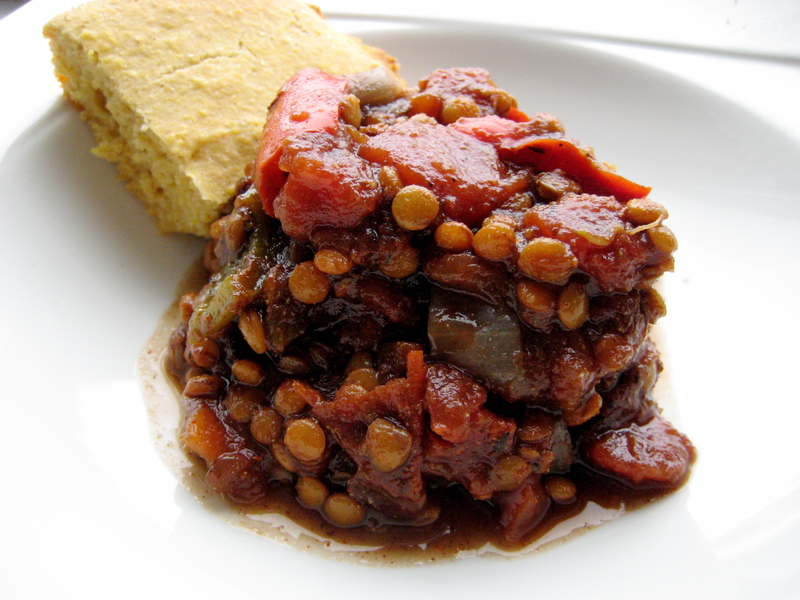 Bring to a boil then reduce to a simmer, cooking for at least 45 minutes, and until the lentils are soft. Stir in maple syrup, add salt and pepper, and adjust seasonings to taste. I'm a cookbook author and recipe developer, and I really like food. I'm also a vegan and was diagnosed with celiac disease about 14 years ago. Aside from frequently baking biscotti and bread, I research super interesting stuff in music, the arts, and our wellness. For more details, check out my About page.